This map shows most U.S. states are growing, though still somewhat feebly. Everyone else is just kind of inching along. The coincident indexes combine different state-level indicators to give us a picture of current economic conditions for that state. Anyway, the latest readings could be way worse — and we have the history to show it. 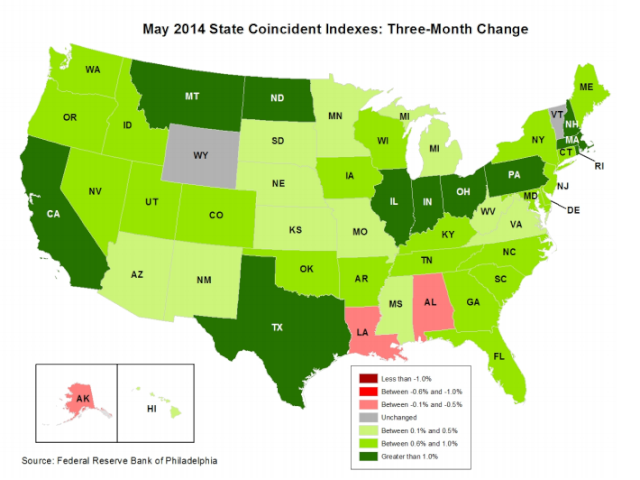 Every month, the Philly Fed publishes a colour-coded map tracking economic activity across the country. Red shows economic contraction while blue or green show expansion. Texas dipped one spot to No. 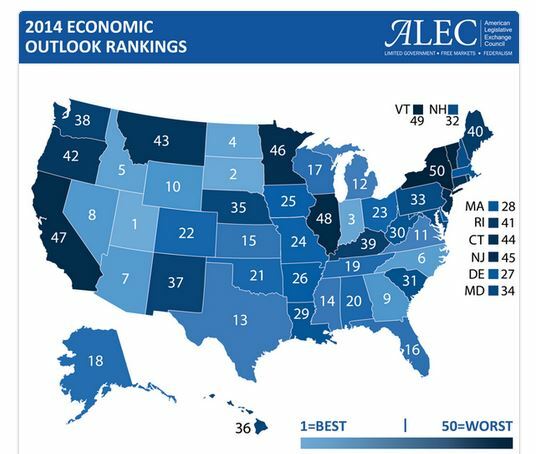 13 this year in economic outlook competitiveness as changes in other states improved their rankings, according to new data from the American Legislative Exchange Council, a group of conservative state legislators. The forward-looking ranking aims to identify policies that can help states achieve greater economic prosperity based on 15 policy measures, including tax rates and labor policies. Based on those measures, Utah was No. 1 and New York was No. 50. “The big story in our report this year is that fundamental tax and fiscal policy reforms significantly improved the economic competitiveness rankings of North Carolina [No. 6], Indiana [No. 3] and Michigan [No. 12],” said Jonathan Williams, director of the American Legislative Exchange Council’s Center for State Fiscal Reform and co-author of the report. A list showing how the 50 states and Washington D.C. stack up in job creation between June 2009 and June 2014, ranked from fastest to slowest growth in hiring. You also need to look at each states population to see if it created a meaningful difference.